The famous quote by US Supreme Court Justice Oliver Wendell Holmes Jr. is inscribed above the entrance to the headquarters of the Internal Revenue Service. Most people don’t have a clue what he meant, or in what context the statement was made. They simply parrot it around to justify the state’s racketeering behavior. They’re all logical fallacies, and assertions backed by zero objective evidence. There’s not much that’s civilized about confiscating people’s assets at gunpoint and spending it on bombs, drones, and wars. 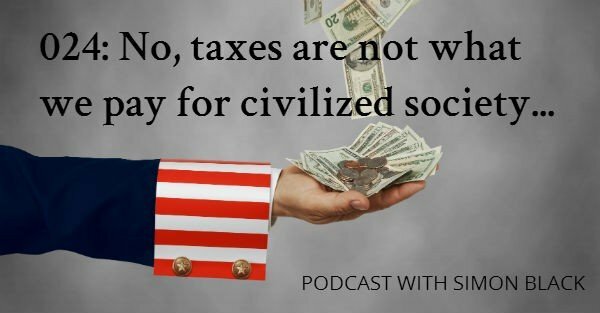 In fact, taxes in the United States are not even a civil matter– they’re an entirely criminal matter. As nearly every tax communication duly informs us, you can be thrown in jail for failing to file a form. This is not how a ‘civilized society’ conducts itself. At the time when Justice Holmes wrote that statement, the average tax rate in the Land of the Free was 3.5%. Today they keep raising taxes, and they keep printing money, because they’ve built an unsustainable system that depends on debt, overconsumption, and war in order to maintain itself. The truth is that voting is a complete waste of time. The “change” is always hollow; the new guy almost invariably comes an incarnation of the last guy. US government debt now stands at nearly $18 trillion, and they’re borrowing money just to pay interest on the money they’ve already borrowed. They blow through almost 100% of their tax revenue just by paying interest and mandatory entitlements like Medicare. They could literally eliminate almost the entirety of government and still not be able to balance the budget. Of course, no politician is ever going to admit that or act accordingly. So does it really matter who is piloting the Hindenburg? The far more powerful way to vote is with your actions. This, and the whole context behind justice Oliver Wendell Holmes’ statement (it’s rather revealing, really), is what we cover in today’s podcast.